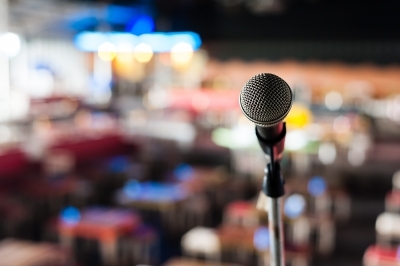 As valuable as the external perspective is, unless this voice is prepared to connect with your audience, their presentation can be a huge waste of time – and money. Let’s face it. External speakers aren’t cheap, and you want to make sure you are getting the most audience bang for your corporate buck. How can you prep speakers to deliver the goods? Follow the following guidelines for pre-production, onsite, and post-show success. Before you reach out the speakers, create a one-page cheat sheet about your organization or division. This isn’t a term paper, just an overview of your audience demographics and content expectations. While it’s true many speakers have prepared remarks that they use no matter where they go, the good ones tailor each appearance to the audience. Next, schedule a 30-minute phone call with your speaker. The purpose of this call is to go over the presenter’s content and identify how it will connect with your audience. Remember that this is a dialogue, so be mindful not to dominate the conversation, especially if it involves rehashing what has already been provided to them in the overview document. Expect to answer as many questions as you ask. Finally, have the producer follow-up – either directly with the speaker or through their representative – with appearance specifics, such as equipment needs, rehearsal schedule, and confirmation of any rider details. The producer will also set a deadline for the speaker to send their content prior to arrival onsite. Identify a single point of contact for your speaker once they arrive onsite. Exchange contact information (email and cell phone), then walk the presenter through their portion of the event. Some may also ask for an agenda, so have it ready because it helps them understand the context in which their remarks will be taken. During rehearsal, encourage the presenter to actually walk the stage, meet the crew, and review any media. Let the presenter know where water will be onstage – dry mouth happens to the best of them, as well as stage entrances and exits. This is also the time to clarify the speaker’s introduction (hint: the shorter the better), any sound or light cues, mic preferences, call time and green room location. Always follow-up with a thank you and ask if there were any opportunities to improve their interactions with your group. Word-of-mouth travels fast for clients as well as presenters, and you want to make sure you’ve done everything possible to make sure your organization’s reputation stay intact. If you have recorded the presentation, providing a video is a nice touch. Speakers are grateful for the content. And finally, hold a debrief with your team about the presenter and your preparation process. Your notes will come in handy for other departments or organizations that may want to hire the same speaker. With a little internal prep, your external presenter will be one of the most memorable parts of your event. Read more about the value external speakers bring in this article.